A proposed private space mission is planning to visit Apollo 17's landing site on the Moon. A German team wants to land a pair of rovers on the lunar surface to inspect the buggy left behind in 1972 on the last crewed mission to the Moon. The group, called PT Scientists, is one of 16 teams vying for the $30m Google Lunar X-Prize. It has signed a deal with launch broker Spaceflight Inc. to secure a ride on a commercial launcher. The XPrize will award the first privately funded teams to land a robot on the Moon that travels more than 500 metres (1,640 ft) and transmits back high-definition images and video. Spaceflight Inc will place the mission with a commercial launcher, but it is not yet known which one. The PT Scientists team has been working with German car manufacturer Audi on the solar-powered rovers, which will be capable of sending back high-definition video. The rovers are expected to touch down 3-5km from the Apollo 17 landing site in the Moon's Taurus-Littrow valley. 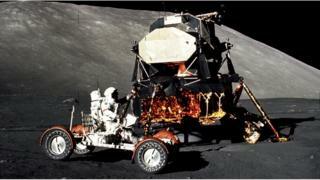 It will then drive to within 200m of the lunar rover and inspect it remotely. Nasa guidelines stipulate that missions should land at least 2km away from US space agency heritage sites and not approach closer than 200m in order to avoid the risk of damage to these historic locations. The rover's cameras should be able to assess the condition of the Apollo buggy and how it has fared in the Moon's harsh environment - including damage from micro-meteorites.